SPRINGFIELD, Mo. 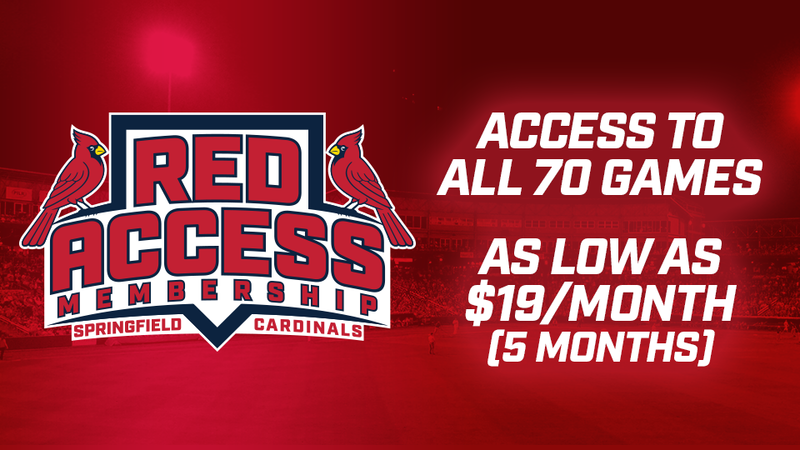 -- The Springfield Cardinals are excited to unveil the most innovative and fan-centric ticket plans in team history, the brand-new RED Access Memberships. RED Access Memberships will take the place of, and greatly improve upon, Season Ticket Plans of the past at Hammons Field. Click the section below for a special message from Vice President / General Manager Dan Reiter! There are four RED Access Membership Levels, each including a reserved seat to a designated number of games AND unlimited access to every game throughout the season. Base Hit Members will have reserved seats for two games per month, Home Run Members (formerly quarter season) will have reserved seats for 3-4 games per month, All-Star Members (formerly half season) will have seats for 6-8 games per month and MVP Members will have reserved seats for all 70 home games. -Access to Flex Pay in 5-Payment, 3-Payment or Pay-In-Full varieties with an automated payment option available. All Members that sign up for a Flex Pay Option or pay in full by October 31, 2018 will receive $10 - $20 in Concessions Dollars per membership. -Access to Pre-Exchange privileges to exchange, in advance, your tickets for any Regular Season game with no upgrade fees for moving to premium games. Online Exchange Access will be available. We want you to come when you want to come! -Access to Post-Exchange privileges for unused tickets that can now be exchanged for ANY remaining Regular Season game in non-inclusive areas. If you miss a game, we don't want you to miss any value of your membership! -Each RED Access Membership will support the Cardinals Youth Initiative by providing an additional two tickets for Springfield-area schools and children's charities. RED Access Memberships are available in all Reserved Seating sections, including the all-inclusive Expedia Redbird Roost, Big Mac Land and SpringNet Champions Club. RED Access Memberships in the Home Run, All-Star and MVP levels also include many of the same great benefits that our Season Ticket Holders have loved for years like access to the Promo Club, Member Discount Mugs, Annual Member Gifts, St. Louis Cardinals Ticket Vouchers and Pre-Sales and more. Springfield Cardinals Vice President / General Manager Dan Reiter will be available for questions and comments inside the Main Gates when gates open this Friday - Monday. Current Season Ticket Holders will be able to keep their seats in the new membership format and will be contacted through the normal renewal process.